Celebrate the union of two family names with this best-seller, bringing both family coat-of-arms together as one, making the perfect gift for weddings, anniversaries or any special occasion! 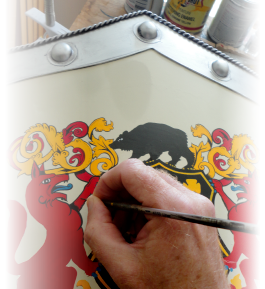 Our best-selling knight shields are sized larger than the cadet, bringing every detail of the authentic coat-of-arms vividly to life, showcasing your family surnames! 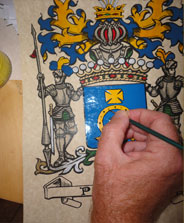 Family surnames are hand-painted at the head, while the family motto or country of origin is added to the base of the shield, and then placed side-by-side on a walnut wood display, for easy exhibit in any home, office or study.